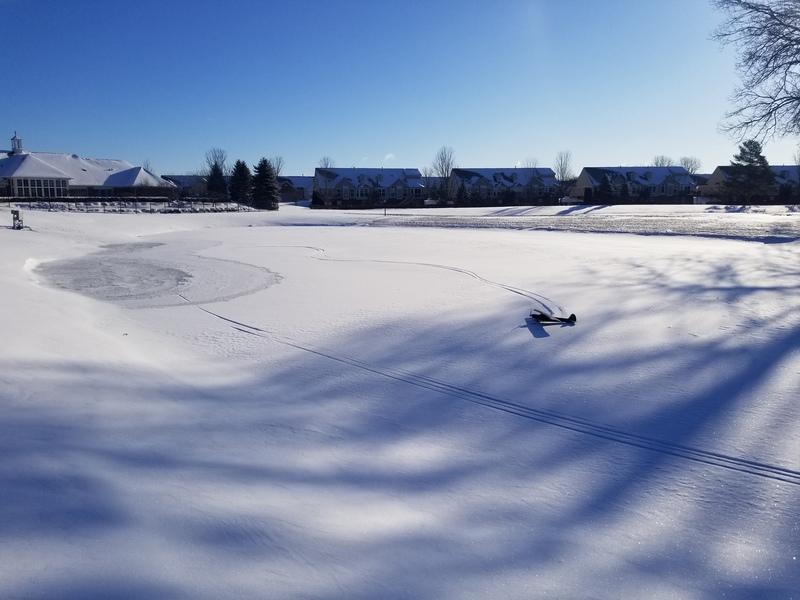 So we have a decent winter storm rolling through SE Michigan. The weather channel said we should prepare for about 6" of snowfall. So I did this. Thoughts? Wait, is that a Storch with the Legacy style landing gear? Are those Ski's 3d printed? Looks good! A word of advice here, if those skis are fixed in place and can’t rotate you may have some issues with flipping over when you hit bumps. To avoid this, use rubber bands or similar to pull the front of the ski up with a non-stretching string at the back to keep it from going to far. 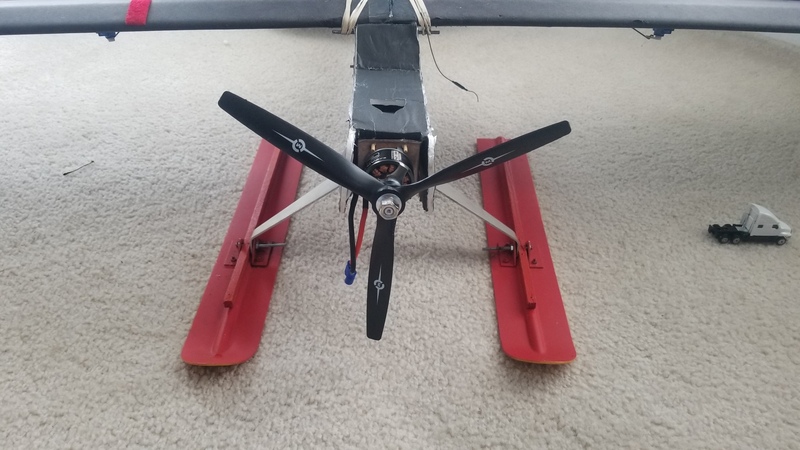 I don’t remember who it was but someone else put skis on the storch here on the forums and they showed how they did it, let me see if I can go find it. Good luck 👍. The skis pivot slightly, but as the bottom of the gear mount is squared off, they can't rotate past a few degrees. It's actually an excellent installation. I'm excited! Here is a few pics showing in-flight position as well as max down angle. Yes, aluminum gear bracket. I like it much more than the stock Storch setup. The skis are... Legacy. Left over from when my father flew RC 35 years ago. Good thinking. Looks like your prepared for the storm. Got to keep the priorities covered. 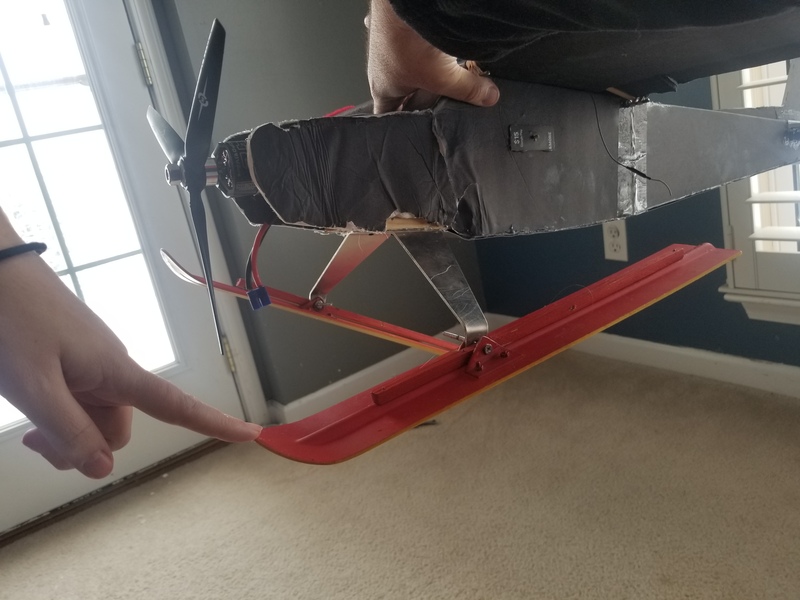 Okay, that should be enough movement, I would still use a band in the front so when you come in for a landing they don’t rotate back and catch on the snow. Now let’s see some tracks in the snow . Do you have pictures to show how you set yours up? Or quick edits a new video and gets it uploaded before power goes out hehe. Already have a foit of snow hete and the heart of it all is just getting to where I am. Yes, you need to keep your eye on the priorities. Ok so my wife is a wimp and refused to take video for me. Also the wind today is gusting to 35 and the temps are 1°F. Do I let that stop me? Of course not! The snow was very deep and extremely powdery. If I didn't maintain speed and full up elevator while taxiing, the skis would sink into the snow. Otherwise it worked extremely well! I do not have pictures of it done right. 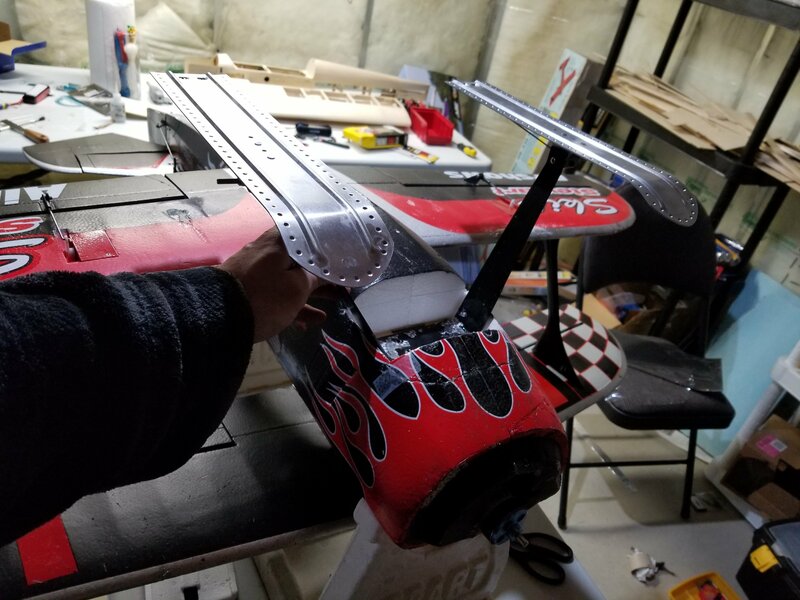 The concept is just something on the front to stop the ski from aiming down(worst case), and something behind the axle to limit the ability to aim up too far (not so bad for landing, but causes hard to fly drag). Other solution is heavy spring loaded skis held with a flat spot on the axle for a large set screw held with loctite. This was last winter's snow plane. This year is a sea duck and an explorer. Much better solution, no skis getting stuck in soft powder. 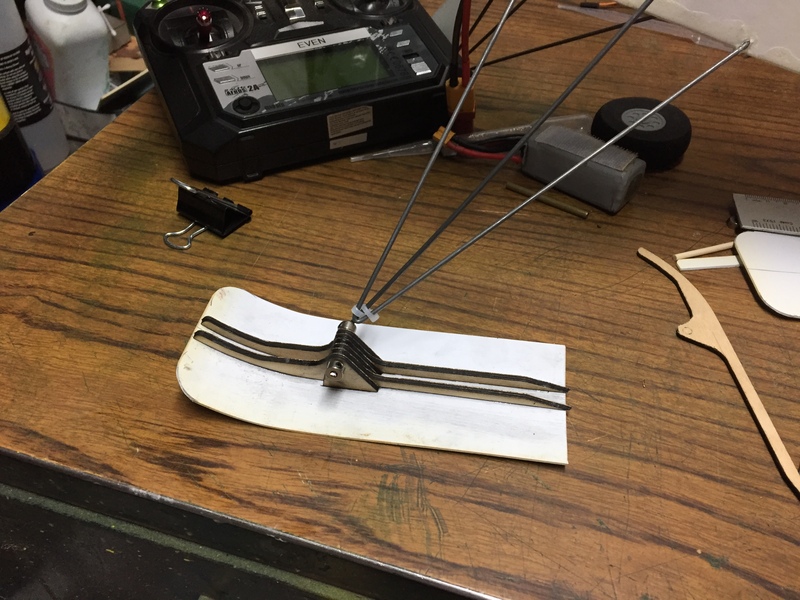 Tie a rubber band to the front of the skis and attach the other end to the plane and stretch it with moderate tension to keep the tips up. 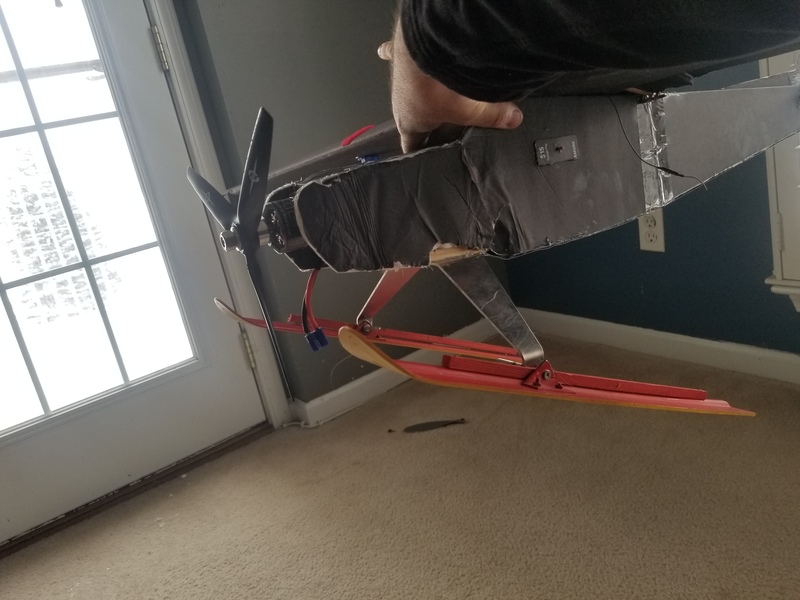 I made some cardboard skis however I attached them too far back and by the time I fixed that all the snow was gone. Well then, I guess I will make floats and convert it into a seaplane now. Also the wind today is gusting to 35 and the temps are 1°F. Your (much) more dedicated than I am!! They aren't nearly as large as yours are and how cool flying with a bit of history! Those would likely work on older, harder packed snow. 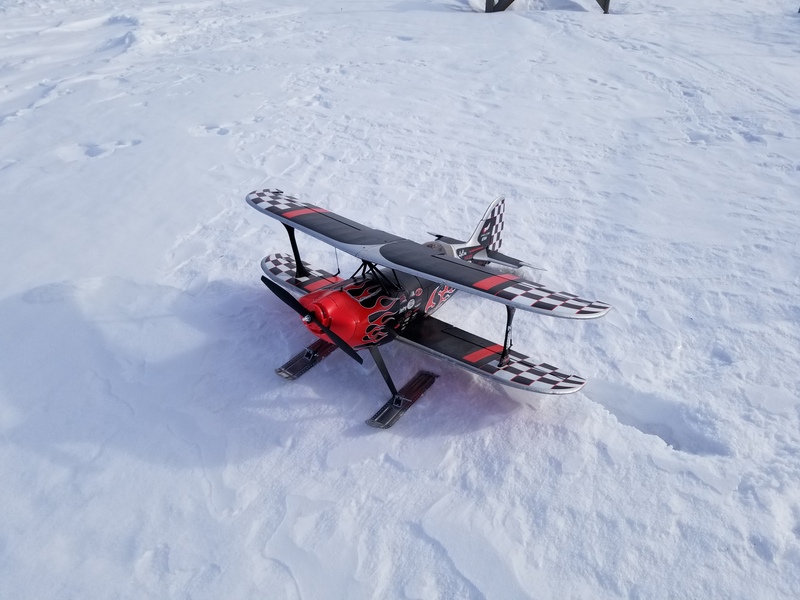 I was flying on extremely fresh, very cold snow so it was extremely powdery. Nothing to do but try it! Wow, I somehow missed this thread until today. Great job, guys! 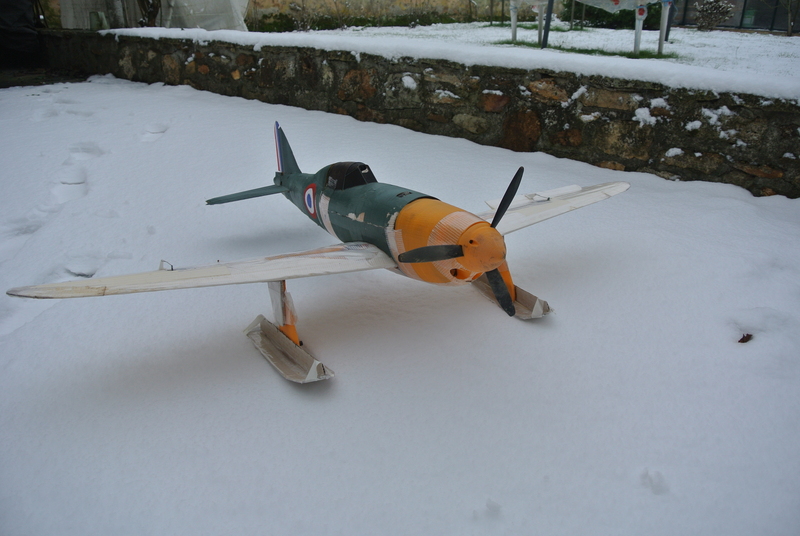 I built my skis for the Storch 4 years ago. At first, I wasn't using any retention mechanism at all, the skis were hanging down from the LG axles. I made sure to make them slightly tail-heavy, and that was more than enough to keep them stable in the air. 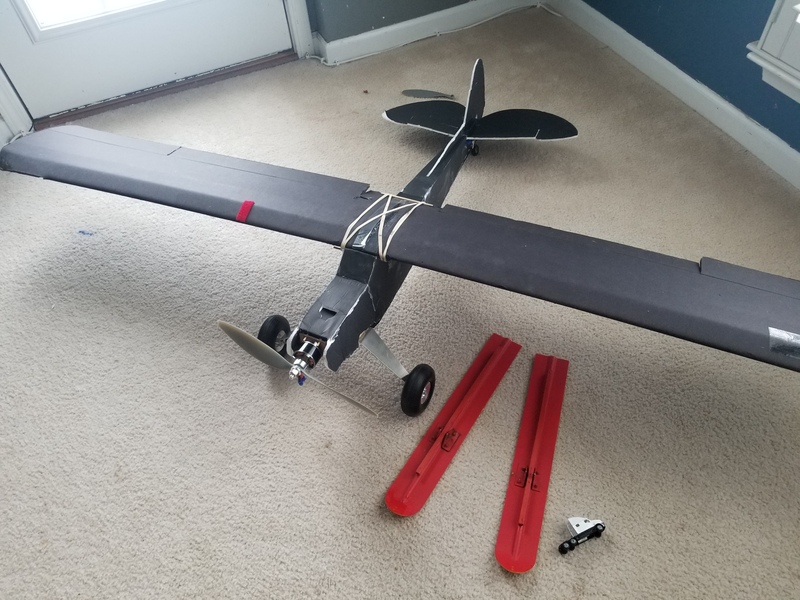 I think the Storch is flying too slow to cause any weird behavior of the unsupported skis; but I also have to agree it doesn't look very nice. You can read all about the design and see how the skis actually look and behave in this article: WINTER SWAPPABLES PART 1: SKIS. About the ski size vs snow type: my skis are slightly smaller than Arcfyre's, and they work perfectly fine on anything other than the very fresh powder-like snow. 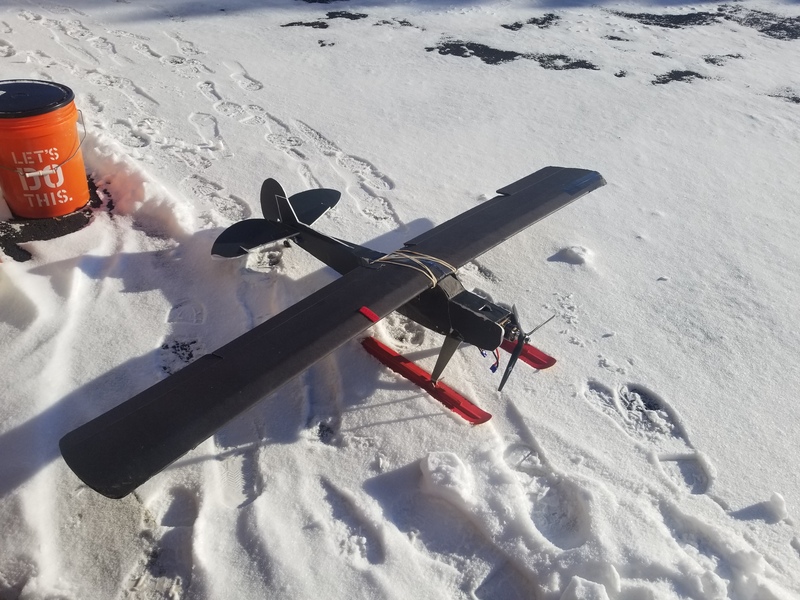 It's enough to have the snow sit for one day (or even just the night) and it gets "hard" enough to fly. 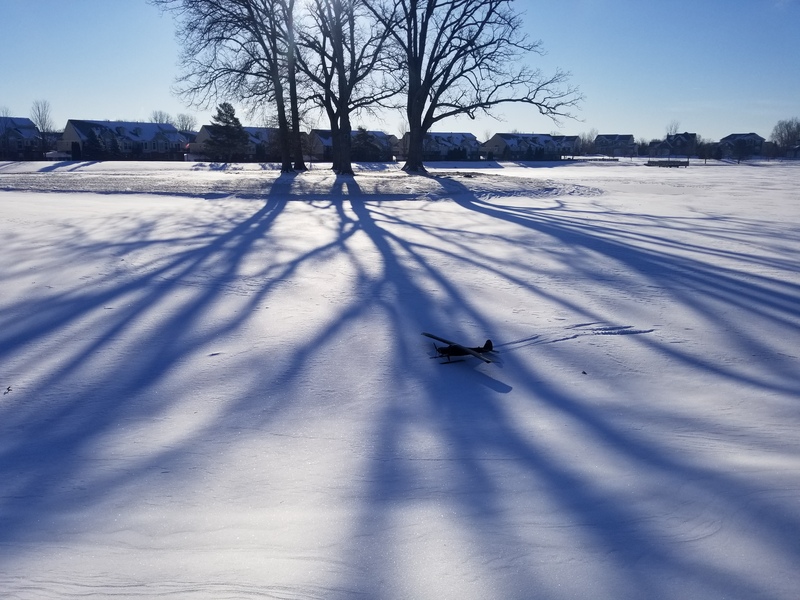 I had more problems flying from "wet" snow (just below freezing point) because it had a tendency to stick to the skis; but other than that I never had to stop flying due to underperforming skis.